» Dogs Bark for Breast Cancer Awareness with Pink Hi Lights. 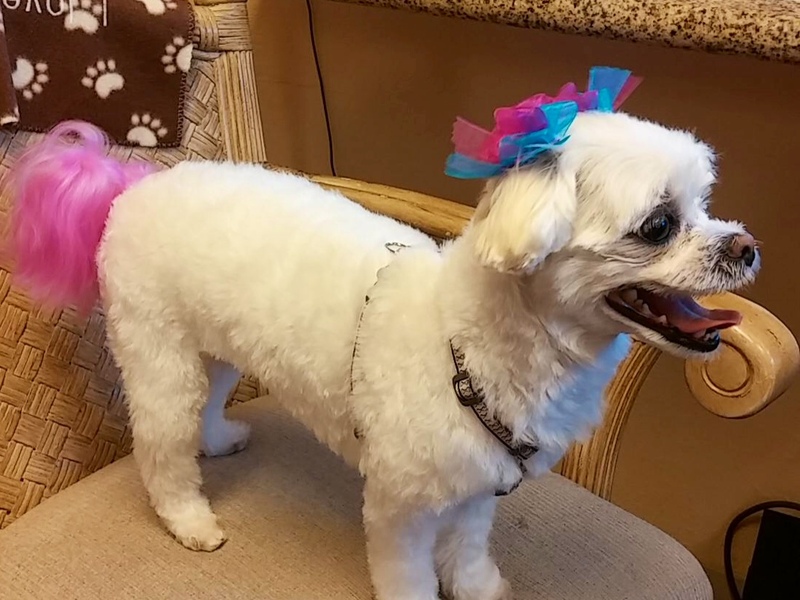 Ocala, Florida Doggy Bubbles - Ocala's Premier Pet Grooming Salon. Home of the Happy Grooming Experience! Welcome to Doggy Bubbles™ Ocala’s premier pt grooming salon! 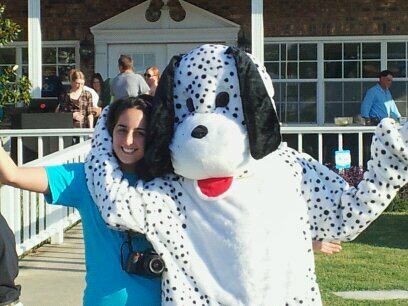 At Doggy Bubbles we believe a happy; low-stress pet grooming experience is what sets us apart. Pets are very sensitive to their surroundings, and relax when they feel loved and trust their dog groomer. In fact, we specialize in training new puppies to be groomed and rehabilitate dogs that have been traumatized. This kind of individualized care takes a bit more time, but is the foundation of our business. And speaking of individualization, we offer over 30 shampoos and conditioners (including medicated treatments) to ensure your pet uncompromised treatments. Doggy Bubbles pet groomers have over 50 years of refined experience including a Master Show Groomer, experienced Vet Tech, as well as a Professional Grooming Instructor. 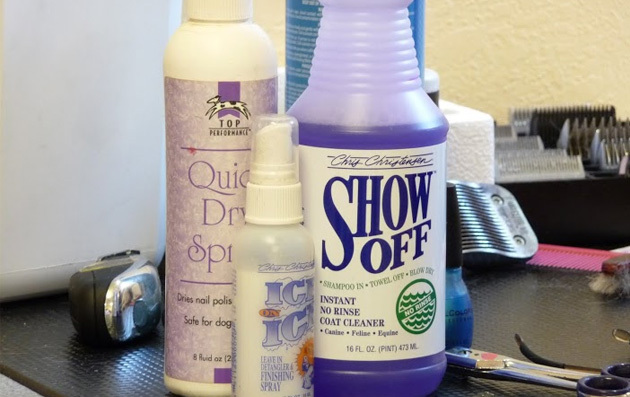 When it comes to dog grooming in Ocala, no other facility in Central Florida offers this level of professional care. Our facility is located with Paddock Park Animal Care Center, Ocala’s leading Veterinary and boarding facility. 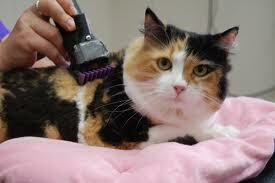 Hence, we provide all types of Vet assisted grooming (such as sedation for cat grooming). In addition, you can conveniently schedule your pet to be groomed after their stay in the kennel. Doggy Bubbles brand new state of the art facility ensures your pet a high-end, unrushed spa experience. The industries finest hydraulic grooming tables, and non-metallic walk-in rubber floored tubs, provide the most stress-free, gentle approach. We look forward to providing your precious pet … A Happy Grooming Experience™. (03/16/2015) Now that the warmer weather has arrived, so have the bugs! This is the time to keep a close eye on your pest for signs of fleas an ticks. It is surprising how many pet in subdivision or apartment yard areas can pick these up. Wherever there are lawns there is the chance for exposure ... it is not only out in the woods. In Florida, these little pests are every where. Be sure to use vet perscribed monthly treatments to keep the bugs away and to protect from heart worm. Let us know if you believe your pet may be affected. 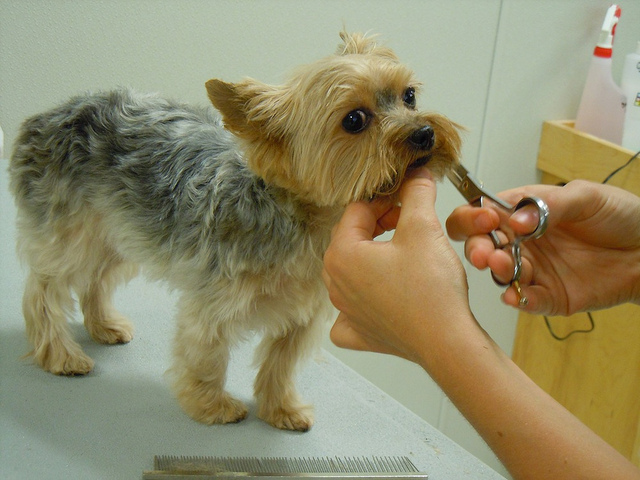 We will give them a careful inspection and have top rated, medicated, pet grooming shampoos to bring quick relief. (12/09/2014) As a lifetime lover and owner of many dogs of various breeds over the past 30 years we have tried all of the premium dog foods. We have had both small and large breeds that struggled with digestive issues and health related problem due to their diet. Too many of our clients share the same story.My precious Lilly, my fifteen year old Jack Russel had lost her spark about 6 months ago. She could no longer digest her food well and had intestinal distress. We were desperate for a solution. 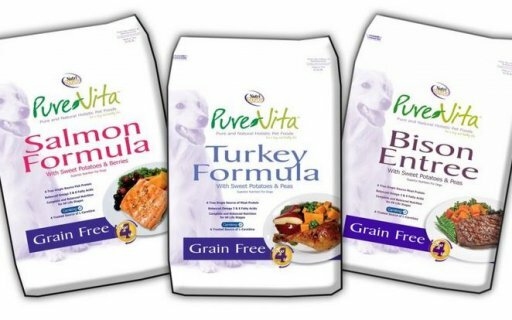 As a last result we tried the all natural, grain free foods called Pure Vita by NutriSource. In a couple pof days, Lilly's digestive issues went away. In two weeks time she literally became vibrant and full of life again. It was as if her biological clock was turned back by two years. Our whole family and friends were amazed.We started using the food on our young active dog and shared it with other pet owners. The results were excellent. We continued to share our story and more and more friends gave the food a try.With Pure Vita bringing significant health and vitality to so many of our friends and client's pets we made the decision to stock and offer the Pure Vita product line to our customers. All natural, grain free foods such as Bison, Salmon and Turkey made in the USA. We beleive and endorse this product so strongly it is the only brand we offer. 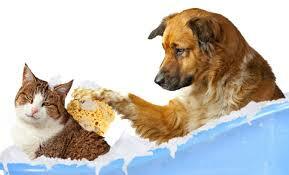 If you love your pet like we do, feed it the best food available, Pure Vita by NutriSource. It comes with a money back guarantee and not one customer has been unsatisfied. Here's to your pets health! (10/22/2014) Doggy Bubbles offers special pet outfits for the Holidays! Have you pet be the talk of the town with special Holloween suits and Winter Holiday petwear.Another fall favorite are special Football Team gear for pets! Yes, show your Gator pride or go Nol's! 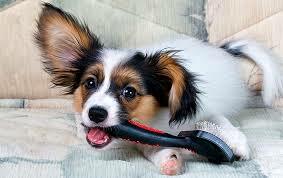 We also offer special Glamor Grooming to add team colors to your pet's coat. Have fun this fall!